As someone who was bullied a lot in school, bullying is a subject very close to my heart. No child should have to go through what I went through. Sadly, many kids go through not only the level of bullying that I encountered, but much worse. I’ve heard some stories of bullying that make my own tales seem like a trip to the spa. Is it any wonder why kids crack and kill themselves or inflict harm on others? When your daily outlook for the foreseeable future is pain and torment followed by torment and pain, your sanity begins to strain. Too much and you can snap. No child (or adult) should ever have to bear this burden. Luckily, there has been a growing anti-bullying movement recently. In fact, there’s a movie headed to theatres March 30th titled "Bully." The movie follows five families as they confront the ugly reality of bullies. The makers of this documentary were not only going to release this movie to theatres, but wanted to screen it in middle and high schools. Now the film-makers have a Sophie’s choice. Their first option would be to mute or bleep some of the bad language. This might get them the PG-13, but at the cost of glossing over some of the ugliness of bullying (something that is important to show to people). Their second option is to petition the MPAA to change their ruling. They’ve lost their appeals so far, but a petition has been circulating which, as of this writing, has nearly 180,000 signatures. Finally, they could release it unrated, but then theater owners would treat it like an NC-17 movie and ban it entirely from their theaters. I will definitely keep an eye on what happens. Hopefully, the MPAA will relent and give the film a PG-13 rating. Either way, B and I will go see this movie in the theater. In other news, a few schools got together to film an anti-bullying video to post to YouTube. The video featured many students dancing to Lady Gaga’s "Born This Way." Sounds like a nice sentiment, right? Not to a parents group. They complained that the video wouldn’t reduce bullying, isn’t accepting of overweight kids/anorexic kids/kids who can’t dance, and that the music is offensive to most religions as well as to atheists. I posted a detailed rebuttal over on Google+. In short, I respect what these kids (and teachers) have done. I think that the parents group is, at best, nit-picking. Any efforts to spread the anti-bullying message help. Kids need to be taught early on that 1) they are perfectly ok just the way they are; they don’t need to change to suit someone else’s view of "normal", 2) other people are perfectly ok the way they are and shouldn’t be expected to change to suit your view of "normal", and 3) people who are different from you should be treated with the same respect you show to people who are similar to you. 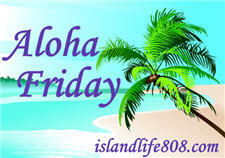 My Aloha Friday question for today is: Do you plan on seeing "Bully" in the theatres? Also, while you’re at it, please head on over and sign the petition. I probably will not go to the theater to see it but would definitely check it out on DVD or tv. I never heard of that movie yet, but please where did you get the widget for losing weight & if you could share any secrets for losing I’d appreciate it. I have to lose weight because I’d look better, but I have to lose to live. Please can you tell me what you do? Thank you so much. My willpower is next to nothing. I try eating all diets stuff, but I’m probably eating too much of it. LOL HELP! I haven’t heard about that movie, but I don’t go to movies much. I work LONG hours. Have a great weekend. I have never heard of that movie so I would have to say no. I just heard about that movie for the first time the other day, and it really does sound like something worth seeing. Liz @ A Nut in a Nutshell recently posted..Do You Love Movie Previews As Much As I Do? I haven’t even heard of it. Thanks for the info. Harriet recently posted..Prada Boots…meant for walking? I think I would fancy a trip to the theatre for “Bully”. Not sure if we’ll see the movie but I do feel something more needs to be done about bullying.